"Excellent analysis of ny MRI. Thank you. " 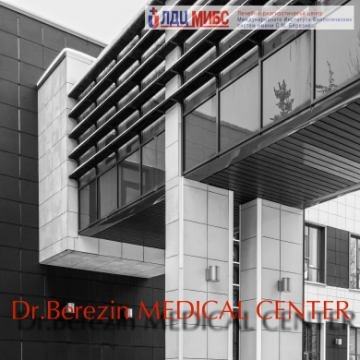 Dr. Berezin Medical Center is a private medical group operating in Russia, Ukraine and Armenia. Our radiology division is the largest in Russia. Every year we perform over 1.3 million MRI examinations. Our oncology clinic is a modern full featured hospital (including Gamma Knife, Cyber Knife, True Beam and linear accelerators). We are proud of our specialists who have undergone comprehensive training in the leading centers and have extensive experience. We are the busiest radiosurgery center in the world for three years running. Carefully selected equipment and qualified personnel position us among the leaders in the industry and make our centers unique. Our doctors continuously improve their skills and actively participate in research projects and clinical trials worldwide. We are currently completing the construction of the first Proton Therapy center in Russia. This is priceless. The specialist reviewing my MRI scan found important issues in my brain where my original report from my local specialist reported the same MRI scans as normal. I will use this in the future to double check what local doctors are telling me. Thank you! This was a far more in depth report giving me more answers than my doctor did. I got the answers I was looking for. All considered, a good and detailed report. Took 2 days. Very detailed and comparative report. Thanks for the report Dr. Nadezhda. Thank you. Prompt and clear report. Very helpful and reassuring. Very quick response time. They have given me an more accurate MRI report and I can not seek treatment. Thank you. Thank you for the clear and professional report and follow up answer to my question. This is the second time I have used the services of Dr Berezin Medical Center. Again they delivered on time with information that gave me more information than my own doctor over the results of my scans. A follow up question was answered promptly and provided additional clarity and more information than I requested. Thank you Dr Nadezhda Plakhotina for everything. A fast response with a detailed report, finding something that was initially missed on my first report. Thank you for reviewing and delivering on time. The report was clear and focussed on the questions I asked. I appreciate your help, thank you. Having a second opinion from Dr. Nadezhda Plakhotina was very useful and has provided direction for me in terms of requesting further investigations and referral to a specialist. Dr. Plakhotina also picked up an issue in my cervical spine that was not included in the initial radiology report on my MRI. A very fast and efficient service. Very thorough doctor and quick response. Excellent analysis of ny MRI. Thank you. MD. Graduated from Saint-Petersburg State Medical University, residency in radiology. Focused on prostate cancer (multiparametric MRI, In-bore MR-guided biopsy, whole body MRI for metastatic prostate cancer), chest MRI, MR-safety and management. Fellowships and trainings: University Hospital of Heidelberg, European Society of Radiology (ESR) full member, invited speaker at the European Congress of Radiology (Vienna, March 2016), Russian Congress of Radiology (October 2015). MD, PhD. Graduated from Kursk State Medical University, residency and PhD in radiology. Focused on management of patients undergoing stereotactic radiosurgery and radiotherapy before and after treatment. DWI and MR spectroscopy in determination of continued tumor growth, radiation necrosis or metastases and inflammatory changes. CT and MRI in orthopedics and sport medicine. European Society of Radiology (ESR) full member. MD, PhD, Associate Professor. Graduated from First Leningrad Pavlov Medical Institute. Residency and PhD in neurosurgery at Russian A.L. Polenov Neurosurgical Institute. Fellowships and trainings: 2005 – Arctic Center of Interventional Neurology of the University Hospital of Umea (Sweden)2006 – Professional retraining in radiation oncology; 2007 – Training in Gamma Knife Radiosurgery at Tokyo Women Medical University (Japan); 2007 – Leksell Gamma Knife Observation Training, Karolinska University, Stockholm (Sweden); 2007 – E.S.S.F.N. 3rd Hands-On Course «Stereotactic Radiosurgery», Marseille (France); 2010 – Course Fonctionnel de Radiochirurgie, Marseille (France); 2011 – Cyber Knife Technical Training Course, Accuray Inc., Sunnyvale (California, USA); 2011 – Clinical Training Cyber Knife Course, Centre Oscar Lambert, Lille (France). Membership: Active Member of the European Leksell Gamma Knife Society; Active Member of the European Society for Stereotactic and Functional Neurosurgery. Focused on radiosurgery (brain tumors, arterio-venous malformations, Parkinson's disease, ophtalmic melanoma). MD, PhD, Associate Professor. Graduated from Pavlov State Medical University. Residency, Medical Academy of Post-graduate Education, Department of General Oncology and Urology, Research Institute of Oncology n.a. Professor N.N. Petrov. Fellowships and trainings: 2007 - 5th European Urology Residents Education Programme (EUREP), Prague, Czech Republic; 2008 - “Salzburg Weill Cornell/MSKCC Seminar in Oncology”, Salzburg, Austria; 2009 - “Salzburg Weill Cornell Seminar in Urology”, Salzburg, Austria; 2011 – Radiation Oncology Training, Universitätsklinikum, Mannheim (Germany); 2011 – Cyberknife Training Course, Accuray Inc., Sunnyvale (California, USA); 2011 – Cyberknife Training Course, Centre Oscar Lambret (Lille, France). Membership: European Association of Urology, European Society for Radiotherapy and Oncology, The Cyberknife Society, American Society for Radiation Oncology. Focused on radiation oncology for body tumors (lung, liver, pancreas, kidney, prostate). MD. Graduated from St.Petersburg State Medical University. Residency in Radiology. Focused on Neuroimaging, Musculoskeletal MRI, Cardiac MRI, Vascular MRI, MR-phlebography. European Society of Radiology (ESR) full member. MD. Graduated from St. Petersburg State Medical University. Residency in Radiology. Focused on breast MRI, pelvic MRI , Whole body MRI for metasthatic cancer. European Society of Radiology (ESR) full member. European Congress of Radiology (ECR) 2016 invited speaker. MD, PhD. Graduated from St. Petersburg State Medical University. Residency in Radiology. Fellowships and trainings: 2008 – training course in advanced MRI imaging of abdomen (European School of MRI, Verona); 2013 – training course in advanced MRI imaging of abdomen and pelvis (European School of MRI, Bruges). Focused on abdominal MRI, multi-modality imaging of breast diseases (breast MRI, digital mammography, stereotactic biopsy under x-ray control). European Society of Radiology (ESR) full member. Russian Congress of Radiology (October 2015) invited speaker. MD. Graduated from Volgograd State Medical Academy, Residency in Radiology (VSMA). Focused on musculosceletal MRI, imaging-based treatment planning for radiosurgery and stereotactic radiation therapy, Parkinson's disease imaging. European Society of Radiology (ESR) full member. European Congress of Radiology (ECR) 2016 invited speaker. MD. Graduated from Saint-Petersburg State Pediatric Medical University. Residency in Radiology. Focused on nuclear imaging, abdominal CT, CT-angiography, and pulmonary vessels imaging. MD, PhD. Graduated from Kemerovo State Medical Academy. Residency in radiology (KSMU). Focused on cardiovascular imaging, stroke, and neuroradiology. MD. Graduated from Saint-Petersburg State Pediatric Medical University. Residency in Radiology. Focused on neuroradiology, functional MRI, epilepsy imaging, pediatric neuroimaging, and CT-angiography. MD. Graduated from Saint-Petersburg State Medical University, Residency in Radiology. Focused on pelvic, prostate, abdominal, and brain MRI. Fellowships and trainings: 2010 - International Cardiac Imaging School (ESCR). MD. Graduated from Saint-Petersburg State Medical University, Residency in Radiology. SPb Pediatric Medical Academy. Focused on pelvic, prostate abdominal and brain MRI, angiography, and gynecological MRI. Fellowships and trainings: 2008 - ISMRMB, Brussels. MD. Graduated from Russain State Medical University. Residency in Surgery. Focused on Interventional Radiology, venous thromboembolism, and pelvic congestion syndrome. Fellowships and trainings: 2008 - Physician Foundation Program, London Medical School, London, UK. European Society of Radiology (ESR) full member, European Society for Vascular Surgery full member. European Congress of Radiology (ECR) 2016 invited speaker. Russian Congress of Radiology (October 2015) invited speaker.